I have been very casually following the popularity of eSports. Most commonly, eSports is defined as multiplayer video game competitions, particularly between professional players. Tournaments such as The International, the League of Legends World Championship, the Evolution Championship Series and the Intel Extreme Masters provide live broadcasts of the competition, and prize money to competitors. One indicator of the emergence of eSports is that it is increasingly noticed by Venture Capitalists. 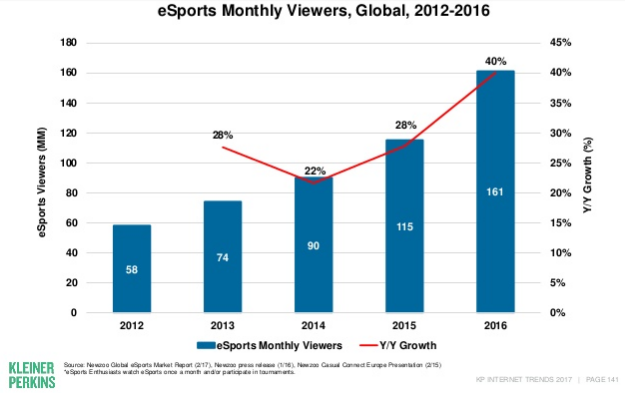 Mary Meeker’s annual Internet Trends Report (published by Kleiner Perkins) has a whole section on the rise of eSports and a few interesting charts of note. Remember – these are people watching other people, professionals and amateurs, play video games. Much like people watch other professional sports such as football or baseball. But they are watching virtual characters on a screen. But from an entertainment value, is it inferior to watching real people play sports on TV? Perhaps its even better, since the area in which these games are played are not constrained by real world limitations. This chart is a little misleading, as the population of the survey was limited to those ‘with at least a slight interest in eSports’. However, given that caveat – look at the second bar in the chart. 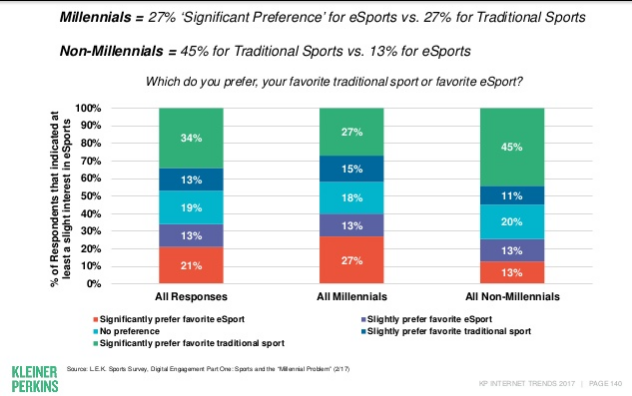 For the millennial respondents, preference between eSports and traditional sports was split. If I owned a pro sports club, I think I would be nervous. eSports is like the Amazon.com of the sports world. It has no brick and mortal requirements, and no players to pay and travel expenses to deal with. If eSports can get continue to grow at near its current pace, we might start seeing alot less people in sports stadiums. 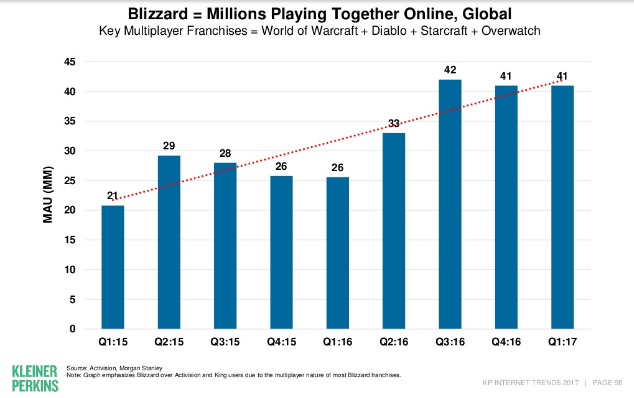 Monthly Active Users (MAU) for the largest Multiplayer games are rapidly growing. This chart shows users have almost doubled in two years. Given the huge technology boom that Virtual Reality could bring to this space, it is not inconceivable that this rate of growth would increase. As more millennials grow up playing online games vs playing schoolyard traditional sports, I have to assume the more future fans of watching eSports will result. I think we are in early days of this entertainment transformation. This could be as big as what online shopping has done to traditional retail. If so, we are in for another wave of disruption, this time to professional and collegiate sports. After a long break from writing for Seeking Alpha, I have gotten back in the groove again and just had another article posted. This article has been brewing in my mind for several months, and I finally had a chance over the long weekend to get my thoughts organized and in ‘print’. To read the whole article, you will have to register with Seeking Alpha (which I recommend to any investor). This site has interesting articles written by a wide variety of authors – a great resource if you are looking for investment opinions.